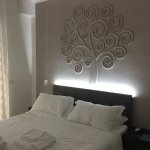 Small luxury designer appartments on the first floor of an old building at the edge of the lovely Spanish Quartier.Nice large comfortable bed, new and modern furniture, clean bathroom with a tiny shower. Good posotion in the historical centre. Car parking is possible near the accomodation (underground garage). The breakfast was perfect (in a cafe 200mts from the accomodation). We stayed two nights so we could explore the city. Located in the Spanish Quarters which gives a, seemingly, authentic taste of the real Naples. The area is made up of many narrow cobbled streets. The room was clean and bright with all usual provisions, toiletries, hot drinks, safe and mini bar fridge. Tokens are provided for breakfast to be eaten at a nearby cafe. We were charged for a fresh orange juice which Lucio insisted should’ve been included and made a prompt call to the cafe to let them know. Lucio was super helpful and helped schlep our cases to the car parked around the corner in the car park. I loved my stay at Dada Suite. I found the reception to be very welcoming, the owner (?) Lucio was extremely friendly, offered me an espresso when checking in and give me loads of tips and recommendations for Napoli and how to get around. Dada Suite is in a perfect location to explore the city, walking distance from most places and close enough to the metro and funicolare. The room was clean and the bed comfortable. Breakfast was served at a little coffee bar just down the street where they offered a great selection of local sweets. I had an amazing experience visiting Napoli and staying at Dada Suite certainly was part of that. I love stay in Dasa Suite. Very pretty room, with all facilities and very vey very clean. Just in the center of the city and only 5 minutes walk from metro station (Toledo). We only used metro only to get from/to the airport. Every other activit (museums, seightseeing, shopping etc) was on foot. Lucio (the guy at reception) very kind and helpful. Breakfast very good is served at a cafe about 200m away on Piazza di Teatre. First of all, Lucio is super helpful and kind, managing this non-hotel option really well. Valentina is absolutely lovely and personable. Located right up the street from famous Gambrinus Cafe and close enough to walk to harbor and ferry Molo Beverello. (We are 50 years old and in good shape, for what it's worth). The only issue for me was that the bed is VERY FIRM, and I had trouble getting comfortable. Shower is super small but water temp & pressure great. Wouldn't give. 5* if it we're $$$$, but it was a great value. 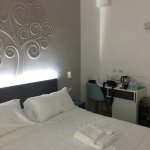 My husband and I enjoyed a long weekend in Naples and loved our stay in the Dada suite. We had a double superior room and it was just perfect. The room is really modern, with air conditioning and a bathroom with a rainfall shower. It comes with toiletries and they even have a mini bar in the room (although we didn't use it). This is a great room in a perfect location (close to Piazza del plebiscito). We loved our stay here and would love to return to both Naples and Dada suite.